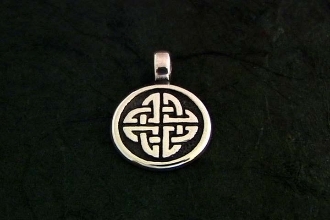 Irish Love Knot Pendant. Sterling Silver. This iconic knot is a powerful talisman. The love knot stands as a solid unity between couples, based on mutual protection and strength. The size is roughly 1/2 inch or 12.7 mm in diameter.